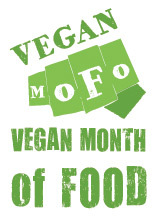 OK, Vegan MoFo, bring on week two! To those of you who are participating and blogging every single day including weekends - you are magical supernatural creatures and I bow to the divine in you. You know what else is divine? 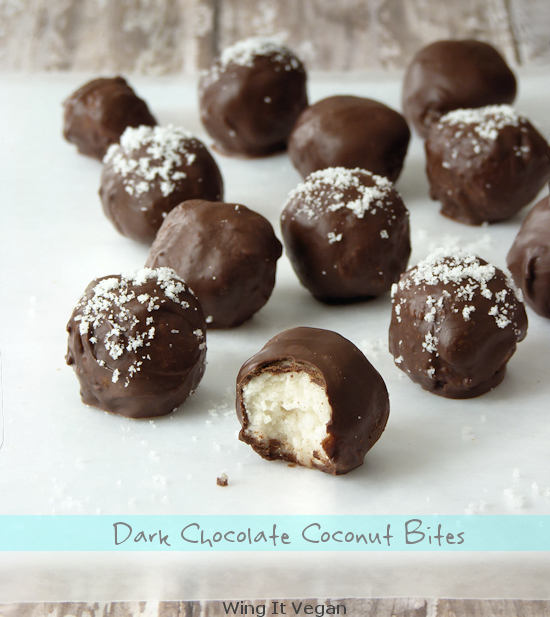 Lindsay's Dark Chocolate Coconut Bites! I regularly read about a million or two food blogs, some are vegan and some are definitely not, and I find inspiration in all of them. 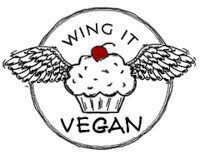 Pinch of Yum is one of the non-vegan blogs that I frequent... frequently. Lindsay is one of the funniest food bloggers out there, her food photography is phenomenal, and she has a heart of pure gold. A lot of Lindsay's recipes call for meat or cheese or eggs, but these days there just isn't much at all that can't be veganized, is there? These fancy little bites, however, just happen to be vegan without any alterations when using maple syrup. Aren't they darling? It's just coconut, sweetener, coconut oil, vanilla, and dark chocolate! Swoon! 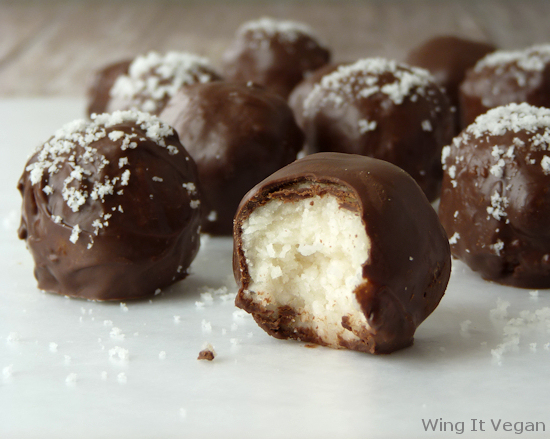 My little coconut bites were made with half dark chocolate and half semi-sweet chocolate, because the heartburn monster awakens with the burning of a thousand Suns if I feed it purely dark chocolate. I was out of maple syrup, so I used about two and a half tablespoons of agave (plus a bit of water to make up for the extra liquid) to sweeten them instead. They are sweet and coconutty and heavenly! Check out the recipe! Thanks for sharing, Lindsay! 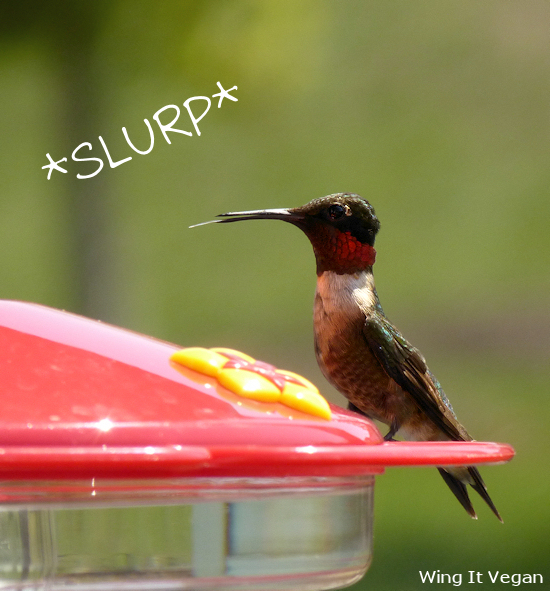 Today's daily dose of cute is a repeat offender - Mr. Hummingbird, who is... maybe trying to catch some imaginary snowflakes on his super long tongue? These look delicious. 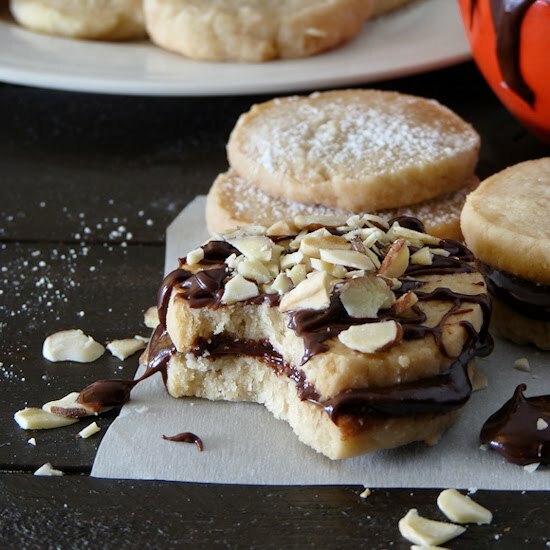 If you threw in some chopped almonds, you could totally have almond joy bites too! I know what I am making for the next last minute party invite. Those do indeed look yum, I love fancy little chocolate treats like these. Me too! They are fancy but they are also very easy to make. Those look so good! I think I might try the above commenter's almond joy idea! It's an excellent idea indeedy! I hope you love them if you make them! OK, the coconut balls look super, but the hummingbird! The hummingbird photo is stunning. How long of a lens did you use for the amazing photo? He's an excellent model! I was actually only a couple of feet away from him. I sat on a chair, quietly and completely still, and used my tripod to keep the camera from shaking. I must make these. They are right up my alley. Yum! Hummingbird tongue?! Too cute! They have the skinniest, cutest tongues! I once made something very similar and formed them into mound bars. I think I'll never make them again because they are way too addictive! I know what you mean! They sure disappear fast. those look yummy! i love watching humming birds - so cute! They provide lots of free entertainment, don't they? We only have four hummingbirds that hang out here, but I've seen videos of dozens and dozens of hummers hanging out in people's yards - that must be so awesome! oh my lordy they look like mini bounties! Which I miss a lot. Also, I once saw nigella batter and deep fry a bounty. Maybe this would make these even more awesome or maybe completely disgusting. I'm baffled by those people who blog for every single day, I just can't do it! I bow down to their superior blogging skills. Thanks for recommending Pinch of Yum, I've never heard of that one before. Those little balls sound awesome, I totally want to stuff my face with them. I don't know how they do it! And people with kids! How?! They must have some sort of secret they're not sharing with us inferior weekday-blogging creatures. I stuffed my face with them. I regret nothing! These are very cute indeed! Those look so very lovely - as does your wee visitor! Isn't he handsome? And wee he is indeed!